July 16; The Government, Parliament and the Election Commission must consider required electoral reforms today, fresh after the experience of General Election 2013, in order to ensure Pakistan can have its 11th General Election as free and fair. These views were expressed at the PILDAT Citizens Forum organised today on Agenda for Electoral Reforms after 2013 General Election. Syed Sher Afgan, Additional Secretary/ DG Elections, Election Commission of Pakistan, Mr. Tariq Malik, Chairman NADRA and Mr. Ahmed Bilal Mehboob, President PILDAT, spoke at the Forum. Sharing ECP’s perspective, Syed Sher Afgan said that in order to introduce certain reforms, legislative changes and new legislation are required. Mr. Afgan said that ECP is planning to hold a post-election workshop to get public feedback on the conduct of General Election 2013. He said that Election Commission is working to enhance the campaign period which is currently 22 days and ECP seeks to enhance it to 30 days. Speaking on the mechanism to monitor and regulate spending by the Political parties, he said there is no such law through which spending by the political parties can be monitored or a limit can be set to them, for which a change laws is required. He said ECP has sought data of political campaigns run on electronic media from PEMRA and different media houses, and analysis has been carried out on how much a party has spent on the electronic media for campaign. This analysis will be made public in a few weeks. As the term for the current members of the ECP will finish just before the next election, the Parliament should ensure that those with required election experience should be appointed as members and the CEC. He also said that only election tribunals can order to verify the thumb impression on the ballot papers in case they receive any complaint. We should learn from our mistakes and nothing should deter us from making our electoral system fool proof, said Mr. Tariq Malik. We have used technology to our advantage. 55.1 million people checked their votes through SMS technology. He also offered NADRA’s support for any legislative changes that may be required to improve the conduct of all future Elections in a free and fair manner. Form 14, 15, 16 and 17 should be on the ECP website, he supported. The polling staff which is trained by the ECP should actually be deployed. He said that he did not receive a single complaint on the computerised electoral rolls as yet. 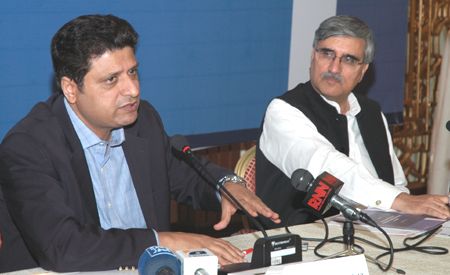 Speaking at the Forum, Mr. Mehboob said that while Pakistan made huge strides towards putting in place required electoral reforms ahead of May 2013 General Election, the less-than-satisfactory conduct of election on the polling day in particular and overall election management in general has once again pushed to the fore some lingering and some new requirements for instituting electoral reforms in Pakistan. 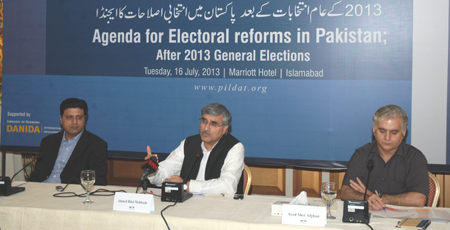 PILDAT, which has been advocating key reforms in the electoral process for a decade in Pakistan, feels that Pakistan’s new Government, Parliament and the Election Commission should re-visit, and put in place, the set of reforms that are critical to ensuring a fool-proof system and a level-playing field to all contestants in every Election. The process for instituting required reforms should begin right away while the lessons learnt from the most recent electoral exercise are still fresh in our mind. Sharing PILDAT’s proposed Agenda of Electoral Reforms in Pakistan, Mr. Mehboob said that the ECP should exercise Control, Superintendence and Discipline on Staff assigned for Election Duty. Better training of Returning Officers & Polling Staff and Training of Polling Agents is also required. He added that monitoring and regulating spending by political parties during Election campaigns as well as increasing of Polling Stations & making those stations permanent also constitute unfinished agenda. He also said that use of thumb impression to check bogus Voting; Voter identification using thumb impression; Polling-station wise statement of count on the ECP website as soon as it is received in the ECP are also required. Electronic Voting Machines (EVMs) should also be employed. Mr. Mehboob also reiterated PILDAT’s proposal that qualifications to become CEC or EC Members must be amended in the Constitution. A PILDAT Policy Brief titled Agenda for Electoral Reforms in Pakistan After 2013 General Election was also shared at the Forum. The brief documented the required reform proposals in the light of experiences of 10 General Elections in Pakistan. The Citizens Forum was organised by PILDAT under the project Supporting Monitoring of Democracy, Electoral Reforms and Development of Youth in Pakistan which is supported by the Danish International Development Agency (DANIDA), Government of Denmark.